Pictured are Kayla Zsido, club vice president; Chris Heintz, affiliate president; Kelly Mills, former club president; Mollie Johnson, club president. 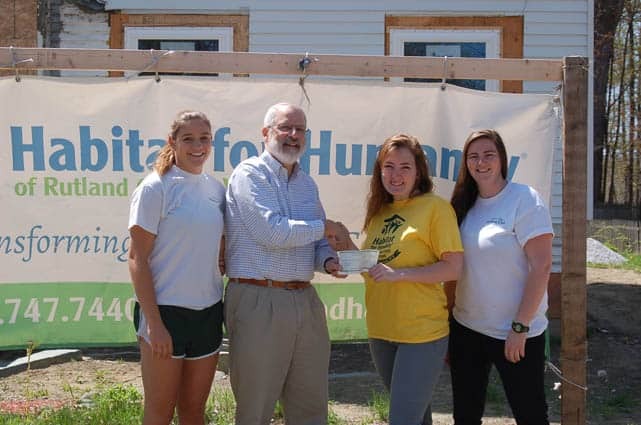 Habitat for Humanity of Rutland County is currently rehabilitating a house at 30 West Street in Fair Haven. “We hope to dedicate the house and have a family living there by the end of summer,” said Chris Heintz, president of the Rutland Affiliate. For more information visit www.rutlandhabitat.com.